Elizabeth Treliving, owner of Home Cooking by Elizabeth, has been working as a caterer for almost thirty years so she knows a thing or two about what makes a great dish. She devised this brilliantly simple recipe at the height of the pick-your-own season at Garsons Farm, Esher, where they grow the best strawberries she's ever tasted, and she describes it as a 'timeless recipe for even a reluctant cook'. The combination of sweet, tangy balsamic vinegar with juicy strawberries, delicately vanilla-scented crème fraîche and crisp shortbread is a twist on that British summer favourite, strawberries and cream. Hull the strawberries and wipe off any dirt. Place the strawberries in a roasting tin and sprinkle with the icing sugar, freshly ground black pepper and the balsamic vinegar. Bake in a moderate pre-heated oven for 15 minutes. 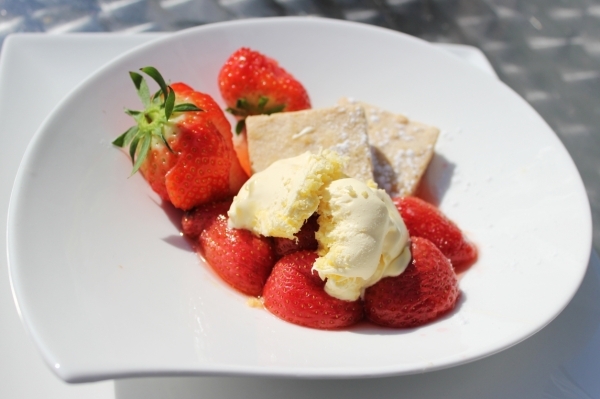 Mix a few drops of vanilla essence into the crème fraîche and serve with the warm strawberries and shortbread.